Research Interest: Surgery, Soft tissue surgery (Wound and Nerve healing), Hard tissue surgery (Bone healing). Radiology and imaging. Herbal Medicine, Wound healing properties of the plants? Study of transcriptional pathways of plants extract and essential oil effects in in vitro and in vivo models; Antidiabetic properties of the plants ?Study of transcriptional pathways of plants extract and essential oil effects in in vitro and in vivo models; Analgesic and anti-inflammatory properties of plants; Antioxidant capacity of plants extract and essential oil. Biography: He completed his docotorate in veterinary surgery in September 1997 - August 2003 from Islamic Azad University, Tabrize branch, Iran. 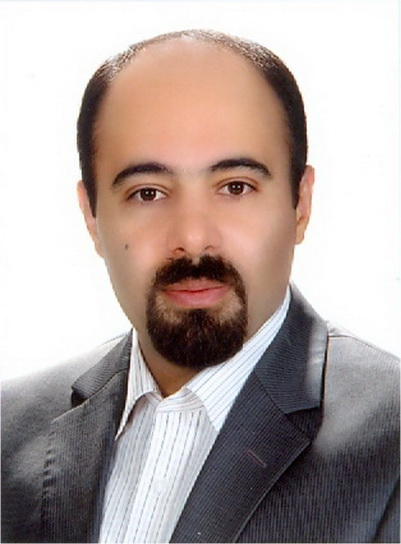 He completed his Ph.D in veterinary Surgery in September 2003- August 2008 from Islamic Azad University, Faculty of Veterinary Medicine, Science and Research branch, Tehran-Iran. He completed his Postdoc in surgery department in September 2003 till October 2015 from Islamic Azad University, Faculty of Veterinary Medicine, working on drugs and herbal extract plants extract and essential oil effects in in vitro and in vivo models. 1. Mohammad Reza Farahpour*, Ghafur Mosavi, Davood Sharifi, Gholamreza Abedi, Aliasghar Behnamghader, Saeed Hasaraki, Seyed Mahmood Rabiee. Evaluation of Compressive Mechanical Properties of the Radial Bone Defect Treated with Selected Bone Graft Substitute Materials in Rabbit. Iranian Journal of Veterinary Surgery. Vol. 2(5), pp. 37-42. 2. Mohammad Reza Farahpour*, Human Taghikhani, Mostafa Habibi and Mohammad Amin Zandieh, Wound healing activity of flaxseed (Linum usitatissimum L.) in rats, African Journal of Pharmacy and Pharmacology Vol. 5(21), pp. 2386-2389, 8 December, 2011. 3. M.R. Farahpour* and M. Habibi, Evaluation of the wound healing activity of an ethanolic extract of Ceylon cinnamon in mice, Veterinarni Medicina. 57, (1): 53–57, 2012. 4. Mohammad Reza Farahpour* and Amir Hossein Mavaddati, Effects of borage extract in rat skin wound healing model, histopathological study, Journal of Medicinal Plants Research Vol. 6(5), pp. 651-656, 9 February, 2012. 5. Mohammad Reza Farahpour*, Amir Amniattalab and Hadi Hajizadeh, Evaluation of the wound healing activity of Cinnamomum zeylanicum extract on experimentally induced wounds in rats, African Journal of Biotechnology Vol. 11(84), pp. 15068-15071, 18 October, 2012. 6. Mohammad Reza Farahpour*, Amir Amniattalab and Hojjat Ismayil Najad, Histological evaluation of plantago lanceolata L. extract in accelerating wound healing, Medicinal Plants Research Vol 6(34), pp. 4844-4847, 5 September, 2012. 7. Farahpour MR*1, Shari? D2, Gader AAB3, Veshkini A2, Soheil A3. Radiological evaluation of the effect of biphasic calcium phosphate scaffold (HA+TCP) with 5, 10 and 20 percentage of porosity on healing of segmental bone defect in rabbit radius. Bratisl Lek Listy 2012; 113 (9). 8. M. Asgharieh Ahary and M.R. Farahpour. Histopathological effects of flowering shoot hydroethanol extracts of Hypericumperforatum on experimental full-thickness skin wound healing in rats. J. Veterinary Clinical Research.4(3)177-187, 2013. 9. Mohammad Reza Farahpour*, Peyman Emami ², Sina Jangkhah Ghayour. In vitro antioxidant properties and wound healing activity of hydroethanolic Turmeic rhizome extract (ZINGIBERACEAE). International Journal of Pharmacy and Pharmaceutical Sciences. Vol 6, Issue 8, 2014. 10. Hosein Nejati, Mohammad Reza Farahpour*. Effect of topical Red grape seed hydroethanol extract on burn wound healing in rats. International Journal of ChemTech Research. Vol.6, No.4, pp 2340-2346; 2014. 11. Mohammad Reza Farahpour*. Antioxidant activity, Antinociceptive and anti-inflammatory effects of Pot marigold hydroalcoholic extract on experimental animals. International Journal of PharmTech Research. Vol.6, No.5, pp 1640-1646; 2014. 14. Mohammad Reza Farahpour*. Assessment of the combined effect of St John's wort hydroethanolic flower extract and flaxseed oil on skin wound healing (in rats). Veterinary Clinical Pathology. 2014. 15. Mohammad Reza Farahpour. The Evaluation of Topical Administration of Different Doses of Lintbells Oil on Circular Excisional Wound Healing in Experimental Models. Iranian Journal of Veterinary Surgery. 2014; 9(2); Serial No:21. 16. Kazem Ghaem Panah¹, *Saeed Hesaraki¹ and Mohammad Reza Farahpour2 Histopathological evaluation of Thymus vulgaris on wound healing. Indian Journal of Fundamental and Applied Life Sciences. 2014 Vol. 4 (S4), pp. 3538-3544. 17. Mohammad Reza Farahpour1*, Lida khoshgozaran2. Antinociceptive and anti-inflammatory activities of hydroethanolic extract of Urtica dioica. International Journal of Biology, Pharmacy Allied Science. January, 2015, 4(1): 160-170. 18. Adel Heersaiy¹, Mohammad Reza Farahpour1*. Borago officinalis hydroethanolic extract improved full thickness wound healing process in experimental animals. International Journal of Biology, Pharmacy Allied Science. February, 2015, 4(2): 573-582. 19. Mohammad Reza Farahpour ¹* and Sarou Sedaghat 2. Effect of Malva sylvestris hydroethanolic leaf extract on the healing of full-thickness, excisional skin wounds in rat. Veterinary Clinical Pathology. 2015. 20. Mohammad Reza Farahpour1*, Ali Heydari1. In vivo wound Healing Potential of hydroethanolic Ribwort plantain (English plantain) leave extract, on experimental full-thickness wounds in rabbits. Research Opinions in Animal and Veterinary Science. 2015, 5(3): 143-147. 21. Hesam Gholami Dogoury¹, Mohammad Reza Farahpour* ², Amir Amniattalab ³. Comparison of Chamomile (Chamomilla recutita L) hydroethanolic extract and Flaxeed oil (Linum usitatissimum seed oil) Alone and Simultaneous Administration with Nitrofurazone in Wound Healing Process. Indian Journal of Fundamental and Applied Life Sciences. 2015 Vol. 5 (1) January-March, pp. 216-223. 23. Mohammad Reza Farahpour, D.V.M., D.V.Sc., 1* and Salar Fathollahpour2. Comparative histopathological evaluation of traditional prescriptions of Flaxseed and Pistacia atlantica for wound healing in rabbit model. Comparative Clinical Pathology. 2015; DOI 10.1007/s00580-015-2097-9. (Springer). 24. Hosein Nejati & Mohammad Reza Farahpour* & Moslem Neyriz Nagadehi. Topical Rosemary officinalis essential oil improves wound healing against disseminated Candida albicans infection in rat model. Comparative Clinical Pathology. 2015; DOI 10.1007/s00580-015-2086-z. (Springer). 25. Mohammad Reza Farahpour*¹, Sina Jangkhahe ghayour². Effect of in situ delivery of acetyl-L-carnitin on peripheral nerve regeneration and functional recovery in transected sciatic nerve in rat. International Journal of Surgery (Elsevier). 12 (2014) 1409-1415. 26. Mohammad Reza Farahpour a, * , Navideh Mirzakhani b , Jamal Doostmohammadi a , Mahmood Ebrahimzadeh a. Hydroethanolic Pistacia atlantica hulls extract improved wound healing process; evidence for mast cells in ? ltration, angiogenesis and RNA stability. 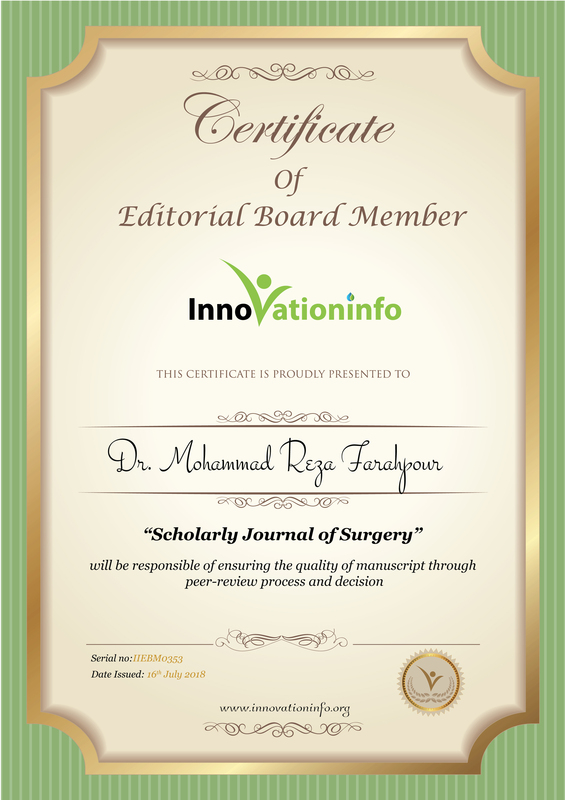 International Journal of Surgery (Elsevier). 12 (2015) 1-11. 27. Mohammad Reza Farahpour ¹*, Aydin Dilmaghanian ², Maisam Faridy ³, Esmaeil Karashi ³. Topical Moltkia coerulea hydroethanolic extract, accelerating the repair of excision wound, in animal models. Chinese Journal of Traumatology (English Edition)- (Elsevier). 2015. 30. Sirvan Karimzadeh and Mohammad Reza Farahpour*. Topical application of Salvia officinalis hydroethanolic leaf extract improves wound healing process. Indian Journal Experimental Biology. 2017. 31. Mohammad Reza Farahpour*, Mahsa Vahid & Ahmad Oryan. Effectiveness of topical application of ostrich oil on the healing of Staphylococcus aureus- and Pseudomonas aeruginosa-infected wounds. Connective Tissue Research. 2017. 32. Farzad Sabuory Bonab and Mohammad Reza Farahpour*. Topical co-administration of Pistacia atlantica hull and Quercus infectoria gall hydroethanolic extract improves wound-healing process. Comp Clin Pathol (2017) 26:885–892. 1. Mohammad Reza Farahpour1*, Keyvan Razzaghi2, Amir Hossein Mavadati3, Mehran Nasiry4; Effects of borage extract in rat skin wound healing model, histopathological study. Veterinary Surgery and 9th Iranian Symposium of, Veterinary Surgery, Anesthesia and Radiology. 2012. 2. Mohammad Reza Farahpour¹*, Moslem Neiriz Naghade ². In vivo antifungal effect of topical Mentha piperita essential oil ointment on infected skin wound (Tissue yeast count). 14th International Iranian Congress of Microbiology. 2013. 3. Mohammad Reza Farahpour¹*, Moslem Neiriz Naghade ². Antifungal effect of topical Thymus vulgaris essential oil ointment on infected skin wound (Tissue yeast count). 14th International Iranian Congress of Microbiology. 2013. 4. Mohammad Reza Farahpour ¹*, Hosein Nejati ², Moslem Neiriz Naghade3. Topical effect of Rosemary officinalis oil on infected skin wound with candida albicans on rats. 14th International Iranian Congress of Microbiology. 2013. 5. Mohammad Reza Farahpour ¹*, Arvin pourrahman ², Moslem Neiriz Naghade3. Topical Application of Thyme Oil Accelerates Infected Wound Healing with Candida albicans (experimental in vivo study). 15th International Iranian Congress of Microbiology. 204. 6. Mohammad Reza Farahpour¹*. Topical effect of Summer savory essential oil on infected skin wound with Staphylococcus aureus in mice. 15th International Iranian Congress of Microbiology. 2014. 7. Mahas Vahid ¹, Mohammad Reza Farahpour ²*, Moslem Neiriz Naghade3. Healing assessment of topical effect of Ostrich Oil and Zataria multiflora essential oil combination on infected skin wound with Staphylococcus aureus in mice. 15th International Iranian Congress of Microbiology. 2014. 8. Elham Kafshdooz ¹, Mohammad Reza Farahpour ²*, Healing assessment of Zataria multiflora essential oil on infected skin wound with Staphylococcus aureus in mice. 15th International Iranian Congress of Microbiology. 2014. 9. Amir Soltanian1 and Mohammad Reza Farahpour*2. Evolution of Securigera Extract on Excisional Wound Healing in Diabetic Mice. 4rd International Symposium of Veterinary Surgery and 11th Iranian Symposium of, Veterinary Surgery, Anesthesia and Radiology. 2014. 10. Hadi Eftekhari1 and Mohammad Reza Farahpour*2. Histopathological Evaluation of β-tricalcium Phosphate (HA+ β-TCP) Granol Potential for Healing of Segmental Femur Bone Defect in Rat. 4rd International Symposium of Veterinary Surgery and 11th Iranian Symposium of, Veterinary Surgery, Anesthesia and Radiology. 2014. 11. Mohammad Reza Farahpour*. The Evaluation of Topical Administration of Different Doses of Lint Bells Oil Ointment on Circular Excision Wound Healing in Experimental Animals. 4rd International Symposium of Veterinary Surgery and 11th Iranian Symposium of, Veterinary Surgery, Anesthesia and Radiology. 2014. 12. Mohammad Reza Farahpour* and Majid Ghafouri. Combination of Cinnamon extract and flaxseed oil accelerate full thickness wound healing in Rabbit. 4rd International Symposium of Veterinary Surgery and 11th Iranian Symposium of, Veterinary Surgery, Anesthesia and Radiology. 2014.